Go from New York to the Niagara Falls by bus! Take this 2-day bus tour from New York to the famous waterfalls on the Canadian border. The Niagara Falls are not only perfect for those on a honeymoon, but anyone wanting to marvel at nature’s beauty and power! 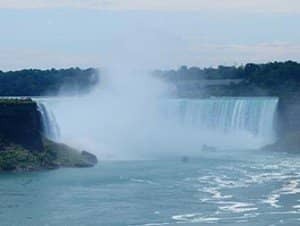 On this tour you will visit both the American and the Canadian sides of the fall and spend a night close by so that you can enjoy the falls once more before you head out shopping. Early in the morning you’ll leave New York City and arrive in the late afternoon. The drive itself is beautiful: you’ll pass the Delaware Gap and Watkins Glen State Park in the Finger Lakes region. Here you will be able to take a stroll through the Watkins Glen Canyon and see (smaller) waterfalls. It’s then straight on to Niagara Falls, passing by the Seneca Lake. The main attraction is of course, waiting there when you arrive – the American Falls. 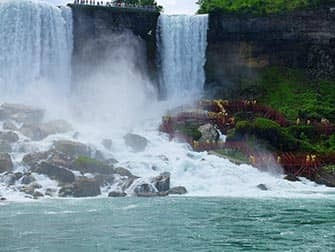 On the first day you’ll not only see the American Falls (the part of the Niagara Falls that is located on the American side) but also the Sister Island and Goat Island. The entire day you’ll be accompanied by a professional tour guide. Return again at night to view the Niagara Falls glowing in colourful lights. You will then spend the night in a hotel on either the American or Canadian sides. The next day you will be able to see the Niagara Falls from another view point – up close and personal. You will hear the roaring thunder of the falls and feel the power of the water as the mist surrounds you (be sure to keep your camera safe!). This magical experience is available aboard the Maid of the Mist (operational in May through October only) where you’ll visit the Horseshoe Falls as close as possible by water. When visiting in winter time, you will be able to Journey Behind the Falls, and head through the Scenic Tunnels behind the falls where you’ll feel the mist of the Horseshoe Falls as it tumbles a good thirteen stories above you. Around noon you will head back to New York by bus, but before arriving you will be able to shop ‘til you drop at one of the largest outlet stores! Find great brands at great bargains and be the envy of all your friends. Eric’s Tip: Both days of this excursion are very long so make sure you dress comfortably, and bring your photo-snapping mood! The second day also includes a stop at the outlet stores so take that into account. 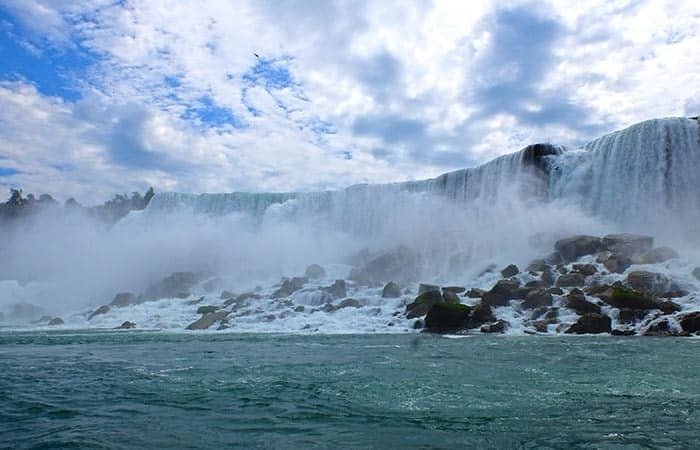 If you prefer to go to Niagara Falls for one day, book this day trip to Niagara Falls by bus.